Hello, this is a bit of a long one but hopefully you'll find it interesting and may be able to help. First off, I'm not a paddler, I cycle a lot. I have no idea about the rules, laws, safety issues about this, so please go easy on me. As I say, I'm a cyclist, I set myself lots of challenges, one of which is tile grabbing on veloviewer. If you're not familiar, tile grabbing goes thus: Imagine the world covered in a grid of 1 mile square tiles. Now try and ride/walk/run in as many of them as possible. It's just a challenge, no prizes, there's leaderboards for number of tiles, number of clustered tiles and max square, i..e a big square made up of little squares. My max square is currently 23x23 which may not sound high but that's pretty good generally, That places me 108th in a leaderboard of 169,000. Top guy has a max square of 80x80, but he drives places and then rides, I'm doing all mine from home. Still with me? Good. So I live in Leigh near Wigan. I've found that my max square, if I want it centred around my house, is now restricted by the Mersey and Ribble Estuaries. I best include a picture here to help understanding. 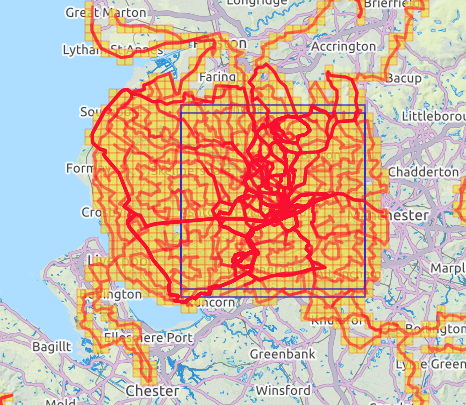 Red lines are where I've ridden, yellow boxes are the tiles, blue square(s) are my max square. I want to canoe the Estuary here to allow me to spread my square and clustered tiles across to Cheshire and Wales. Is it dangerous? I appreciate there are some strong tidal currents going on. I've never seen anyone on this stretch of the river, is that because it's pretty grim or it's not allowed. I don't have a canoe or kayak. I have canoed a number of times when I was younger though and have been through various training sessions. Are there local people who might be willing to take me out? Or guide me? Any advice would be appreciated. I'm just trying to work out how viable this is at this stage, or if it's simply a non-starter. I've paddled the Mersey from Widnes up to Woolston weir in Warrington. I was in a sea kayak but friends were in an open canoe. It needs a spring tide, and there's usually a small bore, which can get exciting over the sandbanks rather than in the channel, but not a problem - flows at 6 to 8kts. But I'm not sure whether you're interested in this - there are two blue boxes a mile different? Downstream of Widnes you need to watch for ships and their wash and take care the tide doesn't take you into jetties etc - I've paddled from Eastham downstream and round the Wirral; I know others have paddled the bit in between but I don't know the launch/landing spots. It's a potentially serious bit of water because of the speed and the difficulty landing; the banks are typically high walls or mud. I would be happy to take you, in principle, if we can find a date with suitable tides and weather. I'm sending you a PM.